Learn how to make this easy snack cake from scratch! It’s really moist & tender, and it has the same flavors as apple pie! Only 100 calories with no refined flour or sugar! For a while during high school, I followed a new afternoon routine. As soon as I arrived home from school and dropped my backpack in my room, I grabbed a snack from the pantry and opened our family’s laptop. I always visited the same website: one that offered a free online jigsaw puzzle every day. With only 15-20 pieces, I finished those virtual puzzles in less than 2 minutes, yet they still acted as a nice buffer between classes and homework! After completing the little jigsaw puzzle, I opened my textbooks and started nibbling on my snack. I usually reached for store-bought granola bars because they were easy, perfectly portioned, and always delicious. Although I would eat just about any kind Mom bought, I loved the soft-baked ones with fruit filling the most… Especially the ones with cinnamon apple filling. Those tasted like miniature apple pies, and “dessert” for snacking was always fine by me! 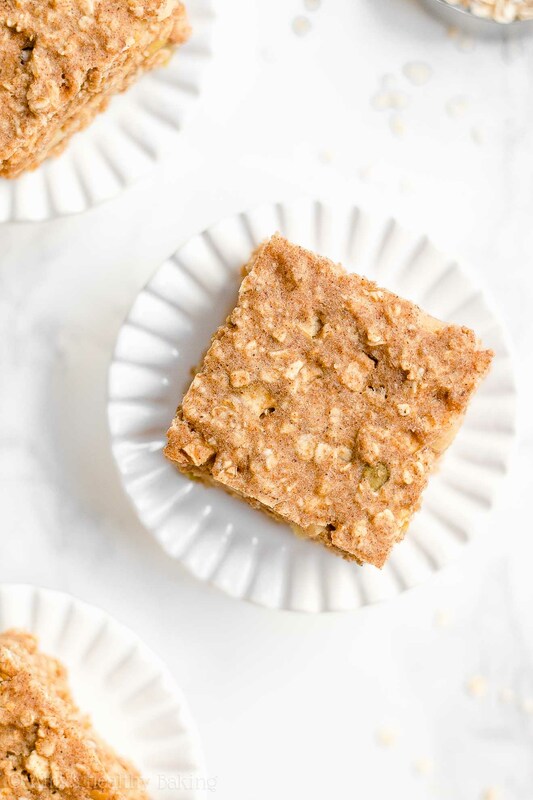 As an adult, I’ve realized that my “apple pie” soft-baked granola bars weren’t exactly the healthiest snack option with all the refined white flour and sugar they contained… But this Healthy Cinnamon Apple Oatmeal Snack Cake has the same flavors, and it’s definitely a much healthier snack option! This easy snack recipe contains no refined flour or sugar (or preservatives, like those store-bought snacks! ), and it only requires a little bit of prep work. Even better, each square has just 100 calories, which is lower than many store-bought snack bars! 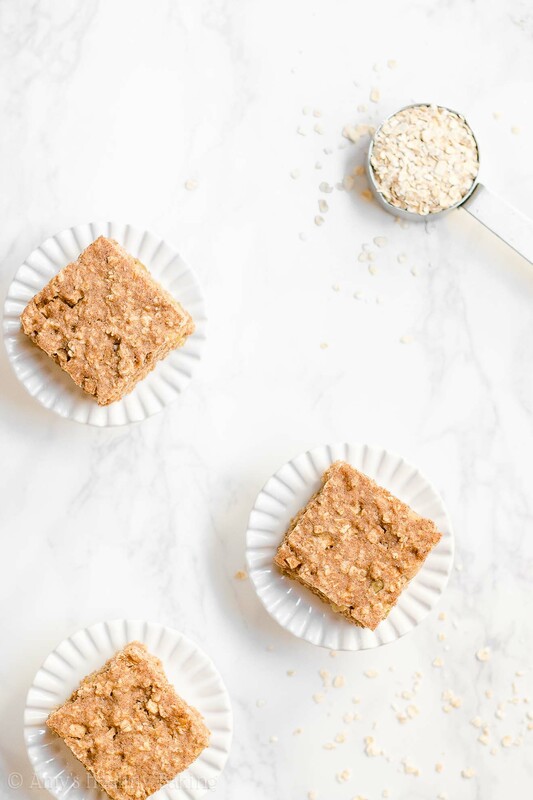 So let’s go over how to make this healthy cinnamon apple oatmeal snack cake! You’ll start with instant oats (this kind—or this for gluten-free!) and whole wheat flour (check the Notes section of the recipe for my favorite gluten-free options!). Instant oats are also called “quick cooking” or “one minute” oats. They’re smaller and thinner than traditional old-fashioned rolled oats, which means your snack cake will turn out really moist and tender! It’s incredibly important to measure the oats and flour correctly, using this method or a kitchen scale. (← That’s the one I own and love!) Too much of either ingredient will dry out your batter and make your healthy cinnamon apple oatmeal snack cake dry and crumbly, rather than moist and tender. This is especially true for the oats because they act like little sponges and soak up lots of moisture from the batter! Next come the spices! Cinnamon (obviously!) and nutmeg (like this!). 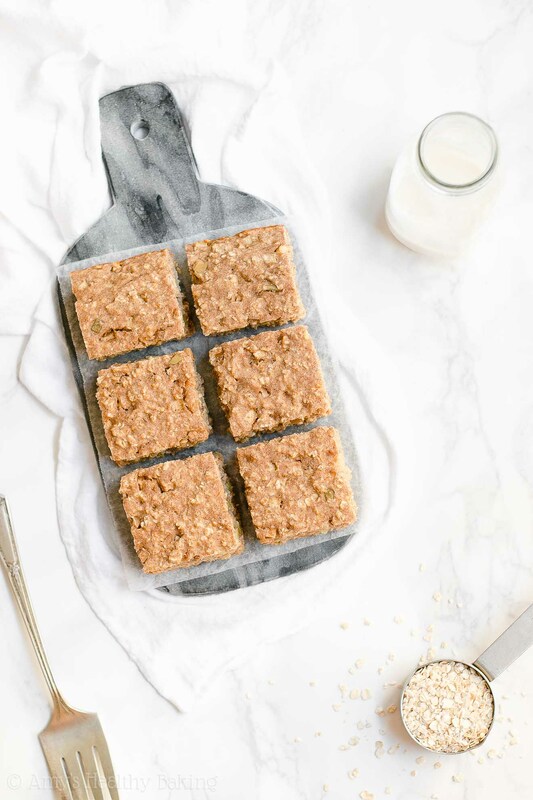 You’ll add both to this healthy cinnamon apple oatmeal snack cake to give it an even cozier flavor. This is my favorite cinnamon because it tastes stronger and sweeter than other varieties, and the nutmeg adds a deeper richness to the spice flavor. With a mere ½ tablespoon of butter in your healthy cinnamon apple oatmeal snack cake, the rest of its tender texture comes from… Greek yogurt! I love baking with Greek yogurt because it adds the same moisture to your batter as extra butter or oil—but for a fraction of the calories—and it gives your baked goods a protein boost, too! 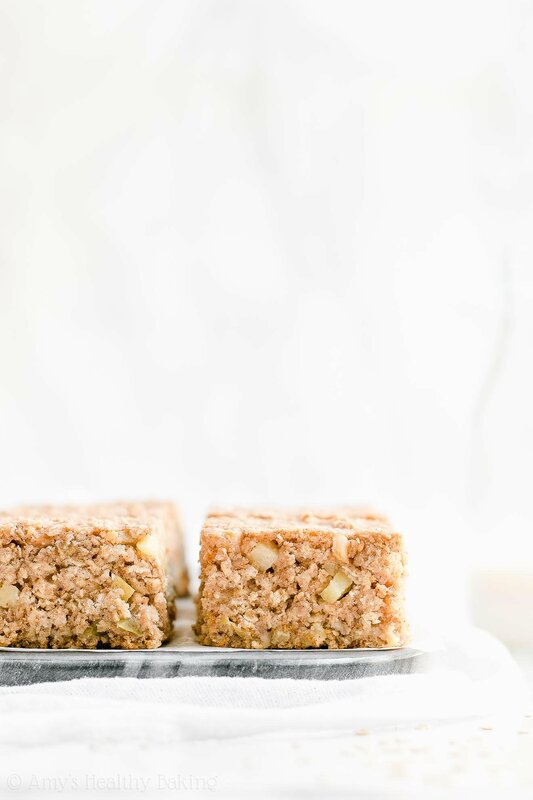 You’ll skip the refined granulated sugar and sweeten your healthy cinnamon apple oatmeal snack cake with pure maple syrup (like this!). You want the kind that comes directly from maple trees! The only ingredient on the label should be “maple syrup,” and it’s generally sold in thin glass bottles or squat plastic jugs (like this!). Now it’s time for the best part… The apples! 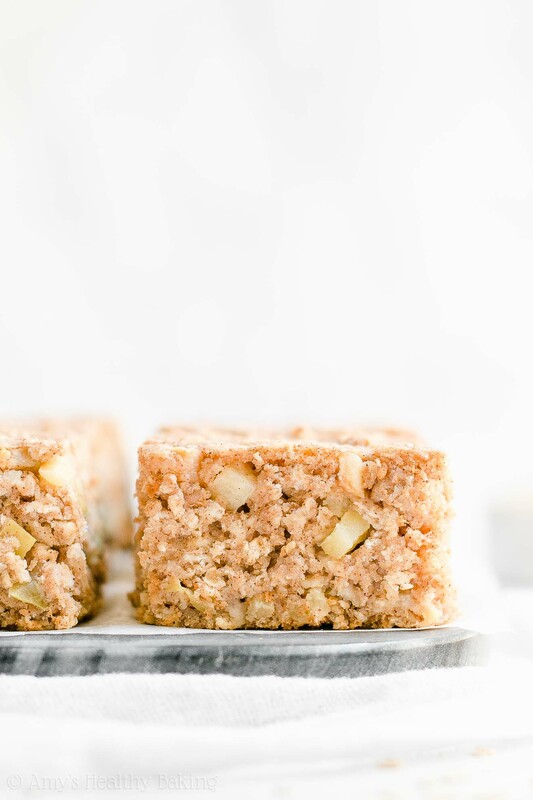 It’s pretty hard to make a healthy cinnamon apple oatmeal snack cake without the fruit, right? ? I prefer Fuji apples because they have a nice firm texture that holds up while baking, and they’re also naturally very sweet. That’s the best combo for baking in my book! Remember to dice them very small, no larger than the size of chocolate chips, to ensure (a) they fully soften and (b) your snack cake bakes evenly. Pretty sure I’d be willing to go back to school if it meant I got to eat this as my after school snack! Although maybe I’d just attend classes for a day or two… ? And when you make your own, remember to snap a picture and share it on Instagram using #amyshealthybaking and tagging @amyshealthybaking IN the photo itself! (That guarantees I’ll see your picture! ?) 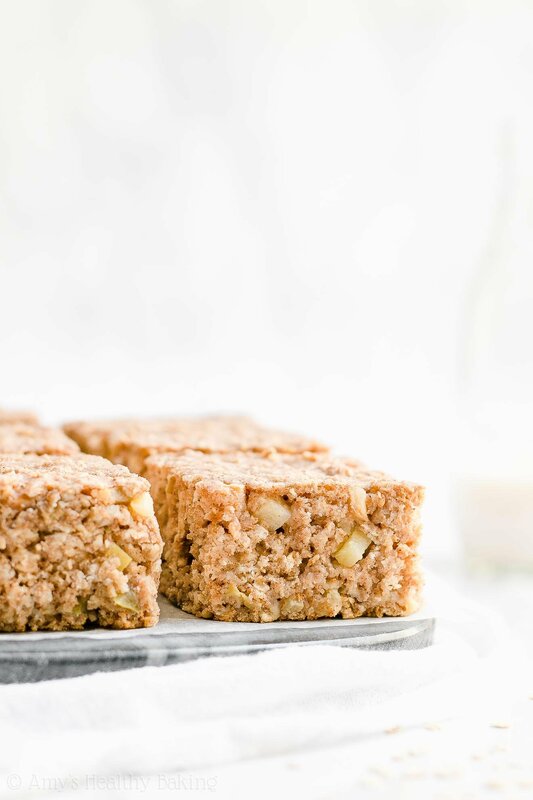 I’d love to see your healthy cinnamon apple oatmeal snack cake! In a medium bowl, whisk together the oats, flour, baking powder, baking soda, cinnamon, nutmeg, and salt. In a separate bowl, whisk together the coconut oil, egg whites, and vanilla. Add in Greek yogurt, stirring until no large lumps of yogurt remain. Stir in the maple syrup. Alternate between adding the oat mixture and milk, beginning and ending with the oat mixture, and stirring just until incorporated. (For best results, add the oat mixture in 3 equal parts.) Gently stir in the apple. Spread the batter into the prepared pan. Bake at 350°F for 24-28 minutes or until the center feels firm to the touch and a toothpick inserted into the center comes out clean. Cool completely to room temperature in the pan before slicing and serving. Notes: Instant oats are also known as quick-cooking or one-minute oats. They’re smaller and thinner than traditional old-fashioned rolled oats. If you only have old-fashioned rolled oats, add the same amount of old-fashioned oats to a food processor, and pulse 10-12 times or until the oats are about ¼ to ⅛ of their original size. For the gluten-free flour, use as follows: ¾ cup (90g) millet flour, ¼ cup (30g) tapioca flour, ¼ cup (30g) brown rice flour, and ½ teaspoon xanthan gum. Most store-bought gluten-free flour blends (like this one!) will also work, if measured like this. It’s extremely important to measure the flour and oats correctly, using this method or a kitchen scale. (← That’s the one I own!) 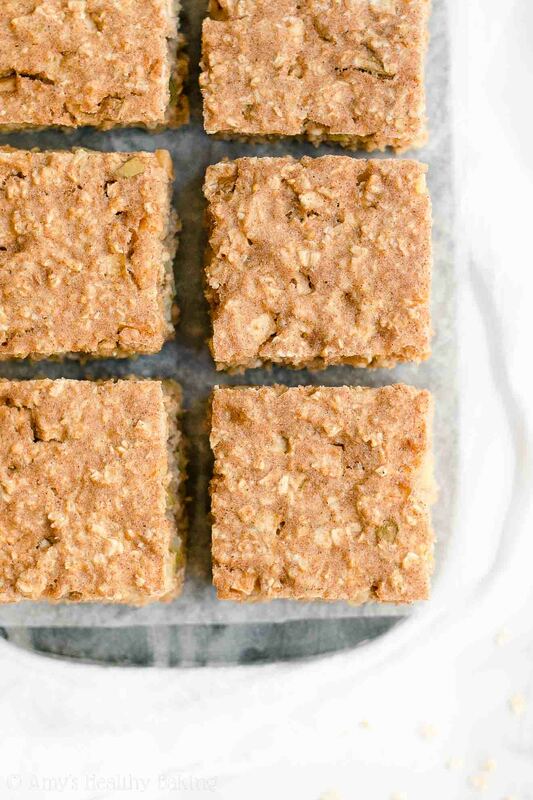 Too much of either will dry out your snack cake and give it a crumbly texture—especially the oats! They act like little sponges and soak up moisture from your cake batter. Make sure to cut the apple to be no larger than the size of chocolate chips. This ensures that the apple will fully soften while baking and the snack cake will bake evenly. I prefer Fuji apples because they’re naturally sweet and have a nice, firm texture for baking. For a sweeter flavor, increase the maple syrup by an additional 2 tablespoons (½ cup total), and decrease the milk by 2 tablespoons (6 tablespoons instead). wish I knew the amount of fat content in your recipes. also calories, sugar etc. I’ve actually included all of that information for you directly underneath the recipe box! I know it can be easy to miss. 🙂 I’d love to hear what you think if you try this snack cake, Helana! 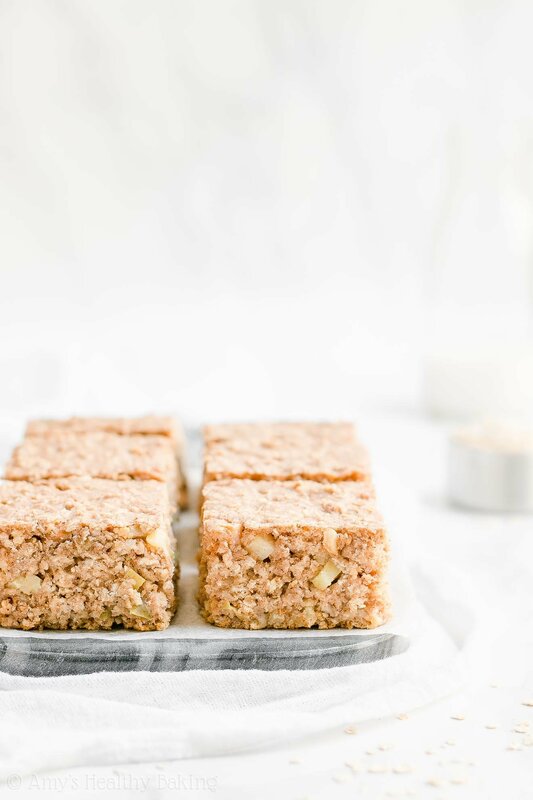 these Cinnamon Apple oatmeal snack cake looks so delicious and healthy, great for kids to snack on and for adults too! I’d love to know if i can exchange the milk with almond milk instead? I really appreciate your interest in my recipe Eli! I’ve actually answered this in the Notes section of the recipe, located directly underneath the Instructions. I know it can be easy to miss! 🙂 I can’t wait to hear what you think of this snack cake! I made these tonight using the 6 T of pure maple syrup.They were pretty good but my family would have liked them to be a bit sweeter. Not sure more syrup would do the trick, I might add 1/8 cup regular sugar next time. With the oats and whole wheat it will still be pretty healthy. Otherwise, thanks for a solid recipe! I really appreciate your interest in my recipe Amy! If you’d like to make this snack cake sweeter next time, then substitute additional maple syrup for an equal amount of milk. So if you wanted to use another 2 tablespoons of maple syrup, then decrease the milk to 6 tablespoons instead. Does that make sense? 🙂 I’d love to hear whether your family likes that any better! I just made this recipe and it turned out very good. My kids will use it as breakfast tomorrow morning. I hope to sprinkle some homemade strawberry spread on them when they are ready to eat it. I used regular yogurt as I didn’t have Greek yogurt on hand. I used only 1 teaspoon of ground cinnamon and increased my nutmeg to 1 teaspoon. I personally love nutmegs! I’m so glad you enjoyed this cake Kechi! I love your idea of adding strawberry spread on top. That sounds delicious! 🙂 And thank you for sharing your recipe modifications — I always love hearing what tweaks work!